This is a replacement post that I had copy of. Although Mr McConley was an American USN armed guard - he was at the time drafted to a Merchantman. "The web site has had a request from one of our American cousins who is attempting to help a veteran suffering from the after effects of the disasterous Bari Raid"
"I am seeking information about the raid on Bari, Italy that occurred 2 December 1943. I am particularly interested in the exact date of the raid and I am hopeful to find some survivors who would be willing to write a brief statement about the presence of mustard gas, what they witnessed, and especially the first ship that brought supplies to them after the raid and the approximate time/date of that arrival. Anyone with any knowledge of the SS Johns Hopkins Liberty Ship is encouraged to respond also. I am trying to help an 86 year old US Naval Armed Guard Veteran to win his compensation case with the Veterans Administration and without this information and some statements, we have little strength. We appreciate all of you veterans for your valor and dedication to your country, and send our heartfelt gratitude for any assistance you can lend". If you can help with this request - I would suggest that you contact Bethany Kosmider direct, or PM me here. The Air Raid on Bari was an air attack on Allied forces and shipping in Bari, Italy by German bombers on December 2, 1943. "One of the destroyed vessels, the US Liberty ship John Harvey, had been carrying a secret cargo of 2,000 M47A1 World War I type mustard gas bombs, each of which held 60-70 lb of sulfur mustard. The destruction of the John Harvey caused liquid sulfur mustard from the bombs to spill into waters already contaminated by oil from the other damaged vessels. The many sailors who had abandoned their ships for the safety of the water became covered with this oily mixture which provided an ideal solvent for the sulfur mustard...."
At first the Allied High Command tried to conceal the disaster, in case the Germans believed that the Allies were preparing to use chemical weapons, which might provoke them into preemptive use. However, there were too many witnesses to keep the secret, and in February the US Chiefs of Staff issued a statement admitting to the accident and emphasising that the US had no intention of using chemical weapons except in the case of retaliation. 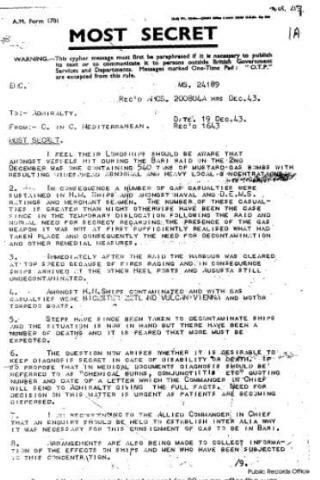 Dwight D. Eisenhower, the Allied Supreme Commander, approved Dr. Alexander's report. Winston Churchill, however, ordered all British documents to be purged, listing mustard gas deaths as "burns due to enemy action". US records of the attack were declassified in 1959, but the episode remained obscure until 1967. In 1986 the British government finally admitted to survivors of the Bari raid that they had been exposed to poison gas and amended their pension payments accordingly. are excepted from this rule. Rec’d AMCS. 20084A HRS Dec.43. resulting widespread abnormal and heavy local concentrations. it was necessary for this consignment of gas to be in Bari. Here you can see the beginnings of the so called 'cover up' - the request to officially recognise the casualties as suffering from 'chemical burns or conjunctivitus' - although probably technically correct (chemical burns), the idea was obviously to hide the actual cause. ....The John Harvey may not have been the only ship carrying Mustard gas weaponry at Bari. Many of the crew on Lyman Abbott, which had also loaded at Baltimore, were seen to put on their gas masks during the attack and when fighting the fire. Also someone on board shouted “Gas” and this was before John Harvey exploded. The question is: who on board would have the knowledge to recognise the smell of gas and why was the ship carrying a supply of gas masks when this was not the norm? The ship was in no danger of sinking but when a rescue party boarded the ship they found it abandoned. Many years later one of the rescue party wrote to the US Navy Department and asked some questions only to be told that “Our records show that only one ship was carrying Mustard gas, the Lyman Abbott”!!! All the above information is now known by "bakos", but it will be interesting to know the outcome of Mr McConley's claim. I'll keep you posted with any news that I receive.. The Lyman Abbott was severely damaged in the wake of the huge explosion and caused several casualties and shortly afterwards was abandoned. I had been knocked unconscious by the same explosion and when I recovered took part with four shipmates in rescue and salvage operations from HMS Zetland's boat. We saw the liberty ship with fires along her upper deck and decided to give the crew a hand in fighting the fires but we found the ship deserrted. None-the-less we fought the fires for about 2 hours to get them under control. During that time I broke off to make a search of the ship in case anyone had been left aboard but nobody had. The Lyman Abbott was able to sail the next day for Augusta in Sicely for repairs and was able to return to Bari and discharged her cargo before Xmas 1943. I was in the harbour from the first flare being dropped and after the Lyman Abbott episode, in a small boat with another shipmate, boarded four other abandoned merchant ships two on fire which took until dawn next morning. My account together with many other survivor's accounts and stories, including Lyman Abbott and USS John Bascom survivors can be read, together with comprehensive British Official Accounts (once Secret) in my book 'Poisonous Inferno' by George Southern. To the best of my knowledge it is the only published book researched and written by a survivor who was there all night in the harbour.